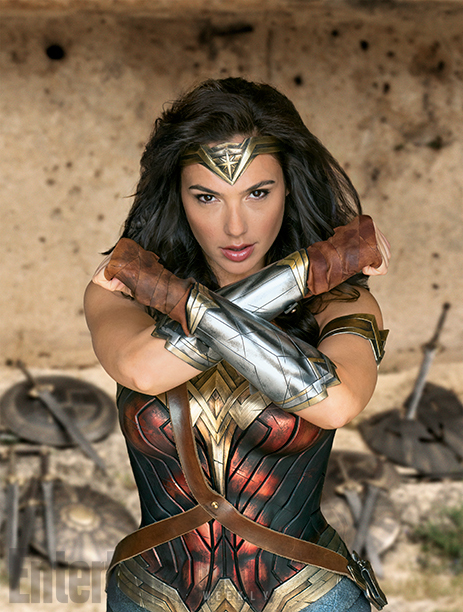 Anticipation is ramping up for Patty Jenkins' Wonder Woman big screen adaptation starring Gal Gadot and Chris Pine. 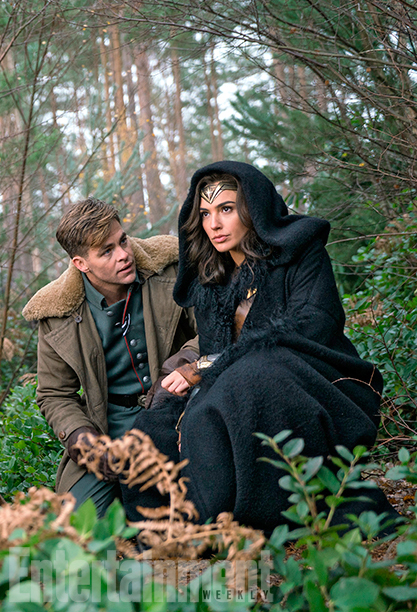 New images from the film have been released and it gives us our best look yet at her costume and what Diana Prince and Steve Trevor look like together in a scene. The film doesn't land in theaters until June 2, 2017 but with this being Wonder Woman's 75th anniversary DC Entertainment has been celebrating the superhero with a number of events. From a plethora of new comic books to having a central role in the animated series DC Super Hero Girls and all the merchandising that comes with it. There's also a variety of activities commemorating her iconic evolution on and off the page scheduled for this year's San Diego Comic-Con. Entertainment Weekly shared these photos from their special Comic-Con issue featuring all the popular genre movies and television series. 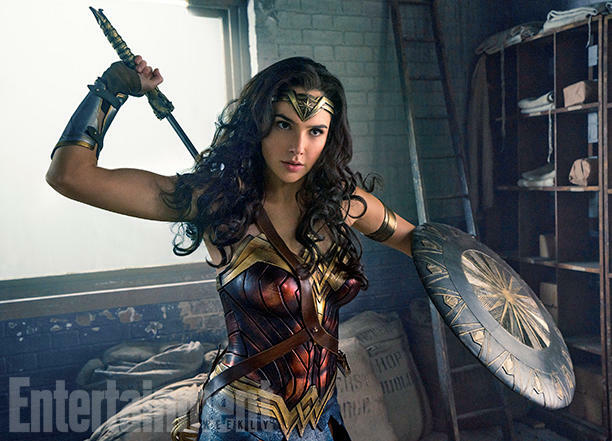 Gadot's costume differs from her Batman V Superman attire with more vibrant colors. She's also visibly more muscular. Some fans were concerned she didn't have the body mass for such a physical role. She's proven that notion to be complete nonsense as these and other set photos have shown her to embody perfectly the warrior princess. "I’ve been very active all my life. I was a combat instructor in the Israeli Army," [she tells EW]. See, everything [in my life] has led to me being Wonder Woman. I gained a lot of body mass after I was first cast in the role. I danced for 12 years and I played a lot team sports: basketball, volleyball. But now I lift a lot of weights. That’s new. I feel much stronger then I was. I feel it on my posture and the way I hold my body. I feel good. I started out very, very skinny and because I gained body mass, I really enjoy the way my body looks… better then I did before. I enjoy the curves. I enjoy the strength, the back, the guns. Now I’m aware of my muscles. And I like it." 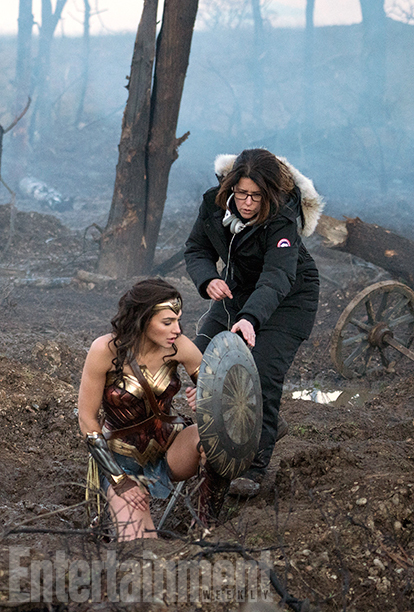 The film also stars Robin Wright as General Antiope, Connie Nielsen as Queen Hippolyta, Lucy Davis as Etta Candy, David Thewlis, Danny Huston, Elena Anaya, Ewen Bremner and Saïd Taghmaoui. The film is written by Allan Heinberg and Geoff Johns, story by Zack Snyder & Allan Heinberg. See Gal's debut as Wonder Woman in Batman V Superman: Dawn of Justice available on home video on July 19, 2016.